I haven’t posted since April 1st? This month has flown by, jeez! I get emails now and then about the apparently very missed KFC on 135 which closed maybe a year ago now. I never went there and don’t miss it but people sometimes ask me what’s going in there so I’m happy to have a report. 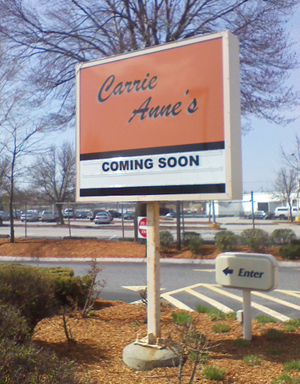 As I was running by the location by last Monday I saw this sign for “Carrie Anne’s”. I’m pretty sure I was the only one of the 27,000+ running by here thinking “Hey! I’ll have to blog about that!”. I just got around to it today and I tried googling them but just got a facebook result. On their info page they describe themselves as “Homestyle breakfast, drive through and more”. There are photos of the extensive work being done for remodeling and what looks like some practice runs of baking (the donuts look awesome) and they look like a happy crew looking forward to opening up shop there. I wish them the best and can’t wait to try it out. They certainly have been putting in the hours to make this happen. Search for them on FB if you’d like to check out their photos. This is great. We NEED a breakfast place. Not too many around. Congratulations on the marathon!! Carrie is the Great Grand daughter of a Framingham Donut Legend!!!! Sounds delicious. If it has home made donuts, I’m there! I was just reading a list on Boston.com lately of all the local donut shops in the state and was bummed none were nearby. This place sounds great!! There was an article in the Tab about this – looks great! This place is fantastic! had breakfast there today. Pancakes, perfect! Coffee delicious, bacon and sausage perfect! Orange juice awesome! Clean clean clean and friendly service. After breakfast got a dozen mixed donuts. I can never eat dunkin again:) These donuts are like krispy kreme but fresher and tastier with a hint of cinnamon! Thank you for opening in that spot. get there early so you can experience the best breakfast place in Framingham. Place has such a great atmosphere i could have stayed there all day:) Thank you CarrieAnne!! Lou would be proud!! I whined piteously at work about having to go to Grainger in Framingham early this morning to pick up supplies. In the future I will be begging to make the morning run – Carrie Anne’s is right up the street. So glad I don’t have a GPS and still get lost and have great adventures! I was thinking it would be great to find a REAL donut place and Lo and Behold….there was Carrie Anne’s! Their raised donuts are liked perfectly deep fried sponge cake! Dense and toothsome! The jelly was just right, the lemon tasted like real lemon curd, not gelatinous slime. The Boston/Bavarian creme was tasty – needs a bit more filling and the chocolate on top was a bit runny – don’t forget napkins. I had it up to my elbows! The woman who packed my dozen had everything she could do to resist licking her fingers! But she did. The cake donuts(I tried plain with chocolate frosting, plain glazed) were all delish! Dense, chewy/crispy! outside had nice cinnamon touch. Not the yellow cake type, whole wheat? Very nice though. I will stand up and take the hit for having eaten 5 donuts in one day. Breakfast, lunch and dinner-go lean tomorrow and run a few extra tonight. Whatever they cook them in – none of the “grease on the roof of the mouth” and they didn’t “slide right thru” as I would expect of 6 chain donuts. Brought some back to work – my co-workers luv me! Have to go back for sit down breakfast. Only thing they need to change is more eye catching signage. Framingham sign bylaw weenies take note!